In 1947, the British Royal Family took a leisurely trip to South Africa and stayed at Natal National Park where Princess Elizabeth, now Queen Elizabeth II, celebrated her twenty-first birthday. As a result of this State visit, the park was renamed Royal Natal National Park. Today, the park welcomes lovers of the great outdoors who are drawn to its spectacular, unspoiled scenery, easy accessibility and abundance of beautiful walking and hiking trails. 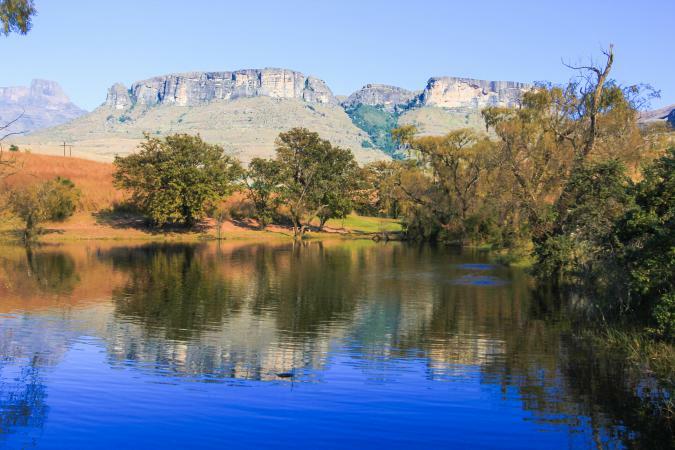 The park is in the KwaZulu Natal province of South Africa and is part of uKhahlamba Drakensberg Park, a UNESCO World Heritage Site. Only 80 kilometers in size, Royal Natal National Park offers a stunning variety of scenery that is easy to access. Hiking is the most popular activity. Trails vary from easy walks that take up to two hours to more strenuous hikes of nine or more hours. 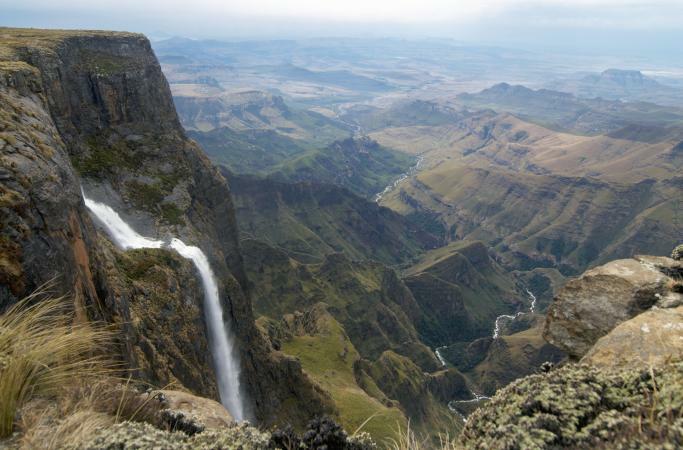 Drakensberg in Afrikaans translates to "dragon mountains." This dramatic mammoth rock formation looks like something out of Game of Thrones. The enormous basalt rock extends for more than five kilometres and is up to 500 metres high, towering over the valley with craggy peaks that form a stupendous amphitheater. The hike to this attraction is moderately difficult and clocks in at a seven-and-a-half miles with a 400 foot or so incline. The curve of the amphitheater lives up to the Zulu word for this natural wonder: Quathlamba, or the "Battlement of Spears." Gorgeous and not easy to get to, the Tugela Falls are the highest in Africa and the second highest in the world, with a drop of 947 meters down the wall of the Drakensberg Amphitheater. The water doesn't fall in one solid sheet. Rather, it leapfrogs down the amphitheater in five cascades of sheer beauty and power. The source of the falls is known as Thukela Falls at Mont-aux-Sources, located on the highest plateau of the Royal Natal National Park. It is best to visit after it rains, because the falls are not always consistent and in the winter, the upper part of the falls can sometimes freeze. This is an easy thirty minute scenic walk along the Queen's Causeway to the Cascades. Along the way, you will see an arch over the river that was constructed in 1947 in honor of the visit by King George VI and his family. This path leads to McKinlay's Pool where the Gudu stream meets the Mahai. It is a perfect place for a swim and picnic. The hike to this grotto, which is actually two gorges worn through sandstone, leads to a lovely picnic spot. Follow the forest path, meandering along the Mahai River and crossing Golide Stream to reach a picturesque grotto with a beautiful waterfall spilling over the cliffs. This is one of the most challenging hikes in the park and is not recommended for children or people who don't like heights. This rugged, five-mile hike includes climbing on a chain link ladder up a sheer rock face schism called the Crack, unwinding in the jacuzzi-style rock pools of Plowman's Kop (sometimes spelled Ploughman's Kop) and sliding down the steep, wet and very slippery gully known as the Mudslide. If you don't like heights, you may want to climb up the Mudslide and take the Crack down. Amid beautiful scenery, there are two dams in the park that are stocked with brown and rainbow trout: the RNNP Dam and the Rugged Glen Dam. Fishing is also allowed in two rivers; the Mahai provides stream fishing and the Thukela provides river fishing. There is a limit of two fish per day for dam fishing and three fish per day for river fishing. A fishing license is available at most reception desks. There are a variety of accommodations offered at Royal Natal National Park, from cottages and chalets to campgrounds and backpacker lodges. The 26 self-catering chalets of Thendele Camp come in two or four bed configurations, plus there is one six-bed luxury lodge. Prices start at US $60 with panoramic views of the Drakensberg Amphitheater. Most TripAdvisor reviews note that this rustic camp is all about its beautiful location and easy accessibility to the hiking trails. One consistent issue noted by visitors were that the neighboring baboons are aggressive. The chalets in the upper camp were also recommended over those in the lower camp. All chalets have satellite TV and a well-stocked shop with curios, basic groceries and supplies. There are also a number of restaurants outside the park. The Google reviews find this property comfortable. At the Amphitheater Backpackers Lodge, you'll find a wide range of accommodations, including camping in safari tents and ensuite chalets; all are fully equipped with towels and linen, and some bathrooms are shared. Rates start at US $14 for a dorm room with shared bath, US $31 for a double room with shared bath, and US $60 for double room with bath and shower. The cafe offers breakfast, lunch and dinner, and a bar offers ice cold drinks. There is a BBQ area and entertainment on site. Facilities include a self-catering kitchen, Wi-Fi access, table tennis, a jacuzzi, swimming pool, sauna and help desk. There is also a laundry service, as well as guided hikes, a public phone and a shuttle. A plus for this property is that the BAZBUS drops you off directly on the property. There are no restaurants or shops nearby, so it is best to eat here or bring your own food for the self-catering kitchen. This property has gotten rave reviews from Lonely Planet readers and Google reviewers. Author and heritage guide Peter Baxter notes the "helpful reception staff" and "vaguely ethnic decor package." The highest lodge in the area, Witsieshoek Mountain Lodge has simple rooms with stunning views at the base of Sentinel Peak, part of the Drakensberg Mountains. All room quotes are based on bed-and-breakfast rates. There are eight newly renovated chalets with floor to ceiling windows starting at US $71, six rondavel bungalows starting at US $63, six standard bungalows starting at US $57 and six hiker cabins starting at US $38. There is a breakfast buffet, restaurant, bar and internet service. 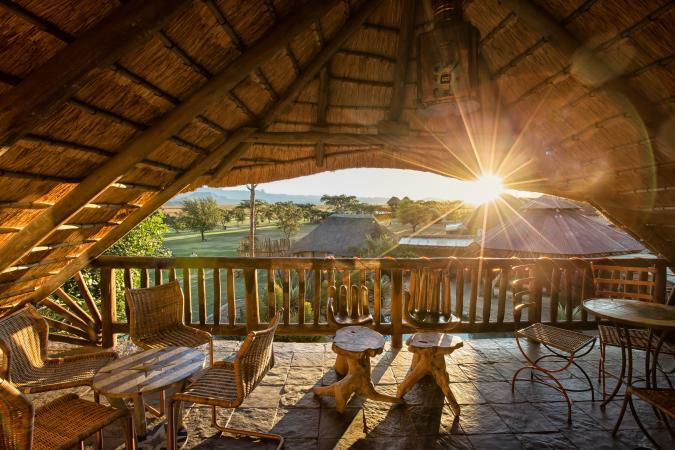 Witsieshoek Mountain Lodge is a Fair Trade Certified property, operated by Transfrontier Parks Destinations. TripAdvisor reviews of this property range from very good to excellent. Travelers find the accommodations clean and modern with good food and fabulous scenery. It was also noted that the accommodations are warm when it snows out. Google's reviews noted that it has a very old-fashion mountain lodge feel and that the rooms are comfortable and clean and that the food is good but expensive. It is important to plan ahead before setting out in terms of general information on South Africa, health, travel advisories, and currency conversion. There are several official government websites that provide up-to-date information. For general travel information, there are two main websites that will help with travel planning: the South African Nature Reserves and National Parks and the South African Tourism Office. For up-to-date information on the political situation and any travel alerts, visit the U.S. State Department's website. It is important to stay healthy. Malaria is a problem in the lower lying areas of the KwaZulu-Natal area, so you should consult a healthcare professional about a suitable prophylactic. The CDC Traveler's Health website is an excellent resource on what medications are advised. A daily conservation fee is payable at the park entrance. It's R25 per adult, R15 per child and R35 per vehicle per day. Simply multiply by the number of days you will spend in the park. For easy currency conversion, print out the handy traveler's cheat sheet from Oanada. To make sure you can enjoy your vacation as safely as possible, keep these key pointers in mind. To avoid bug bites, use repellent and cover up at dawn and dusk when mosquitoes are most active by wearing long sleeve shirts, slacks and socks. Choose hiking boots that are a perfect fit for your foot and for the terrain. One way to ensure this is to have a pair of custom boots made for you. Although there are pharmacies in South Africa, bring your personal medication when you go to remote areas. Average day temperatures in the summer range from a minimum of 15°C (59°F) to a maximum of 28°C (82°F), depending on where you are. In winter, average day temperatures are 19°C to 23°C (66°F to 73°F), although it can get chilly at night, and can snow in higher elevations of the Royal Natal National Park. The best time to hike in Royal Natal National Park is from March to May when it is not too hot or too cool. The Drakensberg area gets snow from June to August, so check weather conditions before you go and remember to bring appropriate clothes. Start your hike as early as you can before it gets too hot. The sun is strong. Bring lots of clean water and sunscreen. 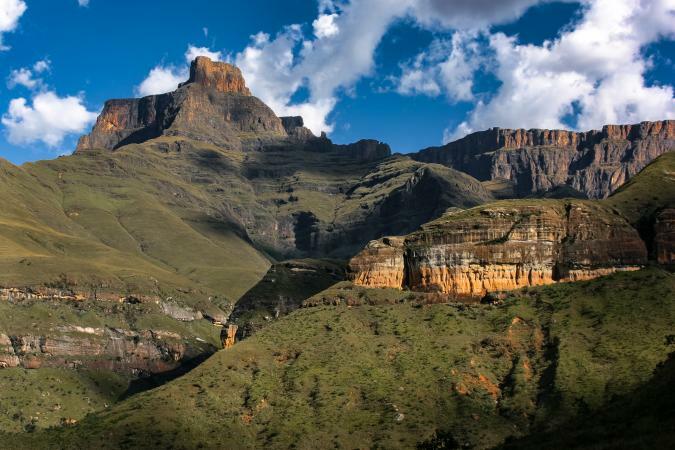 TripAdvisor recommends that if you have time for just one hike in Royal Natal National Park, don't miss Drakensberg Amphitheatre and Tugela Falls. Whether you are an avid or novice hiker, the breathtaking scenery of Royal Natal National Park has something for every explorer. Here, you will discover one of the highest waterfalls in the world, enjoy a picnic lunch in a romantic glen, scale cliffs on rope ladders and unwind in cool, refreshing cascades in an unforgettable setting of great natural beauty.